I've had these on my list to make for a number of years now. 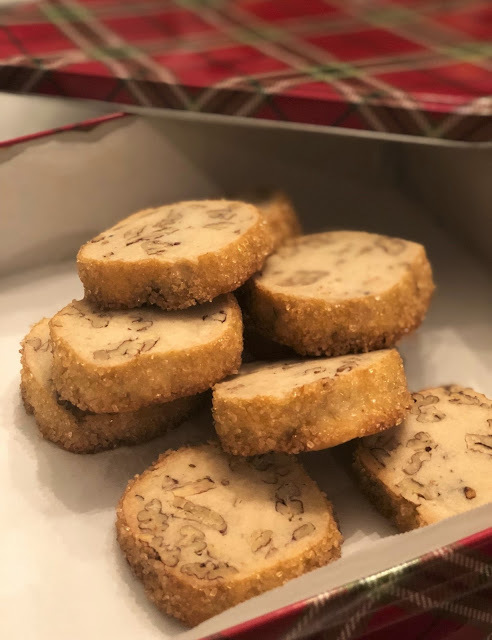 Pecan sandies are such a simple cookie, but they deliver big time! That melt-in-your-mouth buttery goodness that is shortbread, chock full of rich, nutty pecans. I also rolled the edges in turbinado sugar, so each bite also contains that crunchy, sweet crystallized sugar. So, so good! These are another make-ahead cookie. The dough needs to chill for at least an hour before baking, but you could easily whip up a big batch of these and just cook as many as you need at one time. Roll the dough into a log, slice into rounds and bake. Doesn't get much easier than that! In a medium frying pan, over high heat, toast the pecans 3-5 minutes. Keep them moving constantly, until they are very slightly darker and smell rich and nutty. Immediately remove from heat and pour into a bowl - they will continue to cook as long as they're in the pan. In the bowl of an electric mixer fitted with the paddle attachment, beat the butter until smooth, 1-2 minutes. Add the powdered sugar, vanilla, and salt. Beat until combined. Mix in the flour, a little at a time, and mix until just incorporated. Stir in the pecans by hand. I actually found it easier to get an even distribution if I knead them in, rather than using a spoon. Place the dough on a large piece of plastic wrap and form the dough into a log, about 1 1/2 inch in diameter. Wrap tightly and place in the refrigerator for one hour or overnight. To bake, preheat oven to 350 degrees F. Prepare a baking sheet with parchment paper or a silicone baking mat and set aside. Remove the dough from the refrigerator and set aside while you prepare the egg wash.
Lightly brush the sides of the log with the beaten egg yolk and roll in the turbinado sugar to coat. Slice into rounds about 1/2 inch thick and place on prepared baking sheet. 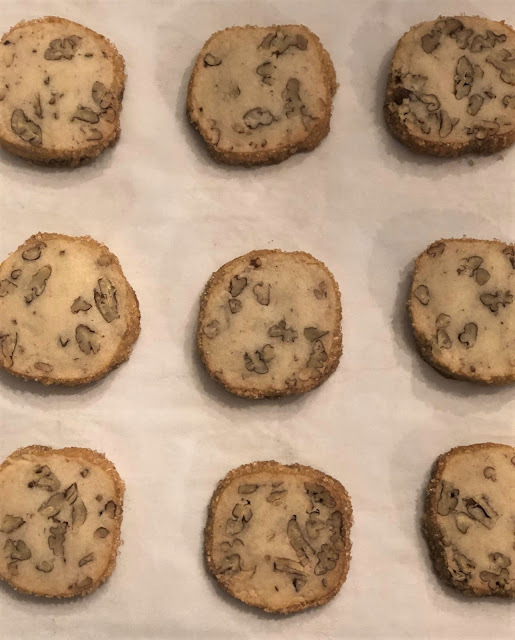 Bake 15-20 minutes (mine baked for 18 exactly), until the cookies are set and the bottom is starting to lightly brown. Remove to a wire rack to cool completely. Store in an airtight container.